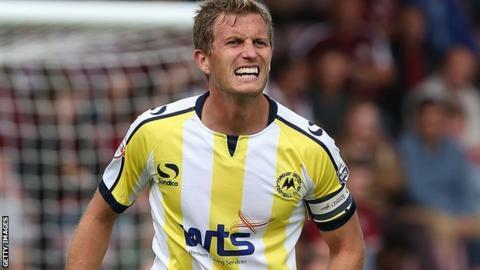 Torquay kept their slim hopes of league survival alive with a vital win against fellow strugglers Bristol Rovers. After a nervy, goalless first half, loanee Shaquile Coulthirst opened the scoring with a brave diving header from Courtney Cameron's outswinging cross. Captain Lee Mansell doubled Torquay's lead with his second goal of the season thanks to a fortunate deflection. Danny Woodards pulled one back from close range as Rovers rallied late on but Torquay held on for a deserved win. The result saw the Gulls end their run of four straight defeats but they are still seven points from safety. Coulthirst's opener was the club's first goal in 420 minutes of football and their first away from home since the middle of February. Bristol Rovers are now just one point above the relegation zone, with just one win from their last eight games. "To say I'm disappointed is an understatement to be honest with you. In the first 20 minutes we started brightly, had one or two opportunities, but after that it was a bit of a dull affair. "Second half we never got going and found ourselves 2-0 down quite quickly. We only had a go in the last 10 minutes which is not acceptable for the circumstances we're in. "We conceded a goal from a set piece, which has been happening to often. "We tried changing things around a little bit with substitutions but they scored the second, knocked the stuffing out a little more and we just didn't get going." Match ends, Bristol Rovers 1, Torquay United 2. Second Half ends, Bristol Rovers 1, Torquay United 2. Goal! Bristol Rovers 1, Torquay United 2. Dan Woodards (Bristol Rovers) right footed shot from the centre of the box to the centre of the goal. Assisted by Ellis Harrison. Baily Cargill (Torquay United) wins a free kick on the right wing. Corner, Bristol Rovers. Conceded by Dale Tonge. Substitution, Torquay United. Aaron Downes replaces Elliot Benyon. Matt Harrold (Bristol Rovers) hits the bar with a header from outside the box. Attempt saved. Kaid Mohamed (Bristol Rovers) right footed shot from the centre of the box is saved in the centre of the goal. Matt Harrold (Bristol Rovers) wins a free kick in the attacking half. Ollie Clarke (Bristol Rovers) is shown the yellow card. Elliot Benyon (Torquay United) wins a free kick in the defensive half. Attempt missed. Ben Harding (Torquay United) right footed shot from the left side of the box is close, but misses to the left. Substitution, Torquay United. Danny Stevens replaces Courtney Cameron. Ellis Harrison (Bristol Rovers) wins a free kick in the defensive half. Foul by Shamir Goodwin (Torquay United). Substitution, Bristol Rovers. David Clarkson replaces Lee Brown. Goal! Bristol Rovers 0, Torquay United 2. Lee Mansell (Torquay United) right footed shot from the left side of the box to the top right corner. Assisted by Shaquile Coulthirst. Corner, Torquay United. Conceded by Steve Mildenhall. Shamir Goodwin (Torquay United) wins a free kick on the right wing. John-Joe O'Toole (Bristol Rovers) wins a free kick in the attacking half. Hand ball by Lee Mansell (Torquay United). Corner, Torquay United. Conceded by Michael Smith. Chris Beardsley (Bristol Rovers) wins a free kick in the attacking half. Goal! Bristol Rovers 0, Torquay United 1. Shaquile Coulthirst (Torquay United) header from the centre of the box to the top right corner. Assisted by Courtney Cameron.